I know someone wondered if I would get to the 30 I promised, given the delay from the site launch. But we’re back at it. And here’s the good news – some of the best plugins are still on deck like MemberPress, WooThemes Memberships & others. But today we’re looking at another full-featured plugin that I don’t actually recommend to a lot of people because of it’s difficulty – but there’s no question there’s a ton of features here. Before we dig in, have you read the other 20 reviews? Today we’re digging into Digital Access Pass – one of the oldest membership plugins around. This is one seriously feature-rich plugin. That’s a pretty big departure from the average. And that’s why the first thing I tell people is that DAP has a lot of cool features but this will take a long time to configure. Some people were unhappy that I didn’t give a great score to S2Member Pro. I’m sure another group of folks will be unhappy that I don’t give DAP a perfect score because they love it. But that is why WordPress is so awesome. Anyone can create their own blog and build their own audience and have their own opinions on their own blogs. All that said, this is still a seriously complex plugin which could take you weeks to get configured correctly. Here is the score, and it’s a good one. Just be warned the learning curve is seriously steep. In years past I have been frustrated with DAP in comparison to some of my favorite membership plugins. It’s because I have a tremendously high value for ease of use and the speed to get something going. If I were to add a weight to my ranking criteria, those two would be the most serious of criteria – because who has time to spend days or weeks configuring a membership plugin? But three things have happened over the last year. Ok, forget the last one. The other two are critical. The world of subscription and membership sites keeps getting more complex. Large companies are delivering subscription products to tons of consumers and those features are becoming “expected’ by all. And that means your product has to step to the plate and deliver. And what we’ve seen is a slowing down of innovation across the 30 membership plugins I’ve reviewing (except the last ones on the list that are coming up!). DAP, on the other hand, hasn’t stopped. They keep charging along at a consistent pace to deliver more and more. And so suddenly, the demands of the customer, the demands of their customers, and the pace of features in DAP have come together to suggest you might want to take a look at them. So as I get nice in my old age, I think, maybe it is worth a week or two of your time to get this thing configured right. And to be blunt, if you’re going to spend a week configuring a membership plugin, I’d pick DAP over S2Member Pro 10 out of 10 times. So what this means is that DAP and Wishlist Member are making a comeback – while being challenged by MemberPress, Paid Memberships Pro, and WooCommerce Memberships. DAP and Wishlist Member are making a comeback against MemberPress, PMP and Woo. All in all, there’s never been a better time to create a membership site – with whichever plugin makes the most sense for you and your business. Before you rush off to buy DAP, you should be aware that just the process to purchase, download, install and activate DAP will take some time. Don’t try this minutes before you’re going to meet with a client to show them something. Because you won’t have something to show. Paying is the easy part. But even then, that won’t be fast. Because one of the features – the ability to offer upgrades – is available to you to experience as you sign up. You’ll be offered all sorts of stuff. Me? I just clicked “no thank you” until I got to the end. And it may have been because I had purchased the product a couple years ago, that my dashboard was a bit messier than yours will be, but that’s when I noticed I didn’t have the “shopping cart” plugin that I had also purchased (part of the deal/package). To do that, you wait until you get an email that tells you that you have to log in to a different site, which requires a different account, so you can download and activate the shopping cart. Getting DAP installed and activated and setup is a marathon, not a sprint. I’m tired already. But this is just to prep you for the effort it will take to get your site working. It’s a marathon, not a sprint. But if you’ve gotten this far in the process, you’re likely ready to spend the time getting your site configured. The other issue that DAP has is that, in my opinion, they expose an incredible amount of detail to site owners that may not even know how an answer / selection will hurt them downstream. Take a look at this screen, one of several that users are presented with to configure DAP. 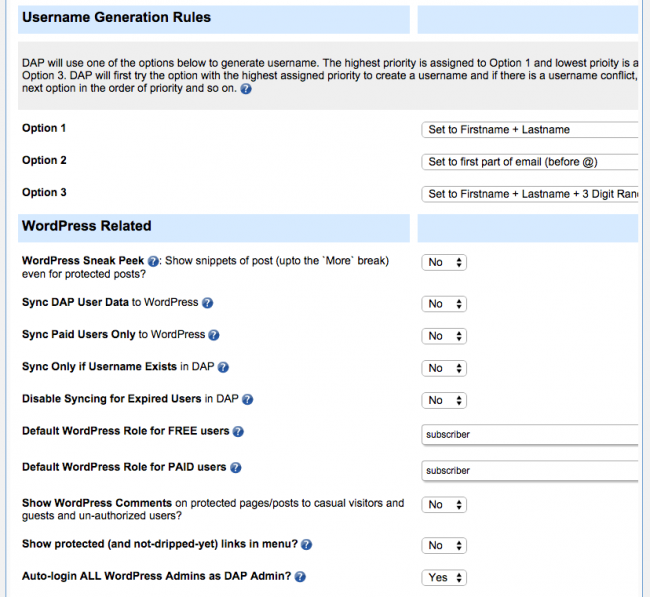 The question I have is this – how will a person know if they should sync DAP users to WordPress users? How do they know if they should only do that for paid users? 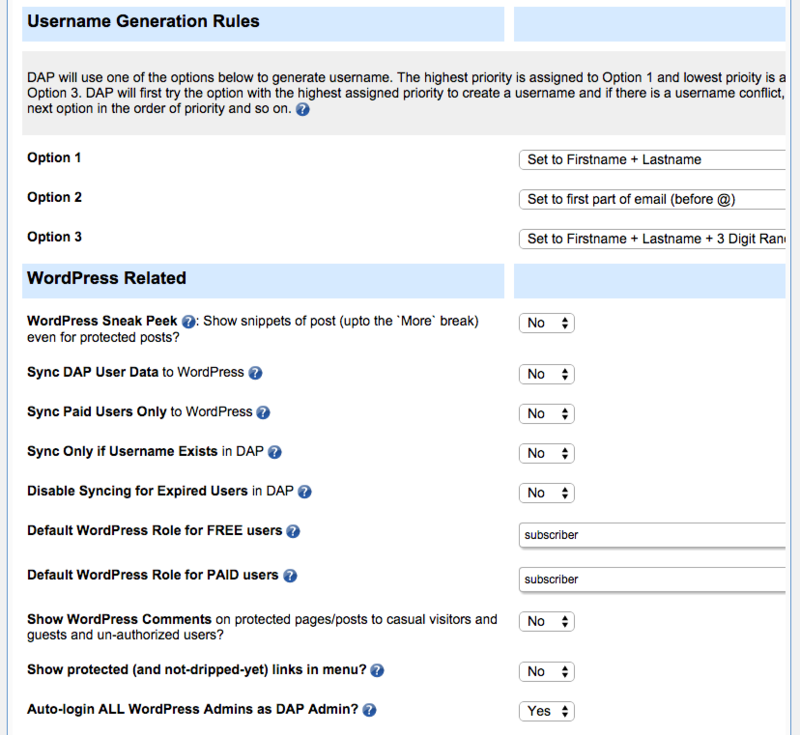 Now, DAP has been awesome and created those little blue question marks to give you explanations, but even the explanations are complex for the average site owner who may not know WordPress well. Like I’ve said way too many times already, this may be perfect for you if you like to get into this level of detail on how your site runs. But it may freak you out and have you running for the hills. But if you run a highly political site where you want people to have usernames like “CrazyHair” instead of “DonaldTrump” then this is perfect. I’ve written before about upsells. Most of the time I’m talking about the ability to upgrade your account. But another kind of upsell is at the point of purchase. This is huge because it’s very little work to create an additional offer that brings in (often) no-cost revenue. What I mean by that is simple. Let’s say that you are creating a membership site and you are charging $24.99 a month for access. The cost of sale to you is likely whatever marketing you’ve spent or affiliate revenue to get this deal. Now that they’re here there is no additional cost of sale. They’re right there – waiting for you to make another offer that is of high enough value to part with additional money. And since they’ve already demonstrated a willingness to pay something, they’re the right folks to make a secondary offer to (versus people who haven’t touched their wallets yet). You can create an upsell offer that says, for an additional $99, you can get access to 3 live webinars with Q&A in the first three months of your membership. Not everyone will go for it, but those that do – have given you extra revenue without extra cost (particularly I’m talking about sales costs). These upsells are not only available as one-time-offers (OTO) during sign up. You can also create upsell options during a person’s membership period. Which is nice. Well, here’s the good news – DAP supports upsells. The rich payment gateway support from DAP is only beaten by WooCommerce and Cart66. Another feature I think you’ll enjoy from the DAP folks is the rich support for payment gateways. Lastly, among all the features that DAP supports, one stands out against most of the competition. Only WooCommerce with the Memberships and Subscriptions plugins might rival it. Product chaining means you can link a person’s membership level (that they purchased) with additional products, membership levels, or protected pages. And when they cancel their membership, you can have all these additional bonus products removed from their account. Normally when people do this, it becomes a nightmare for support to be manually fixing these things. And like I said, I’ve not seen this feature lived out a lot across a lot of membership products, even though it’s a common request. But DAP does it. 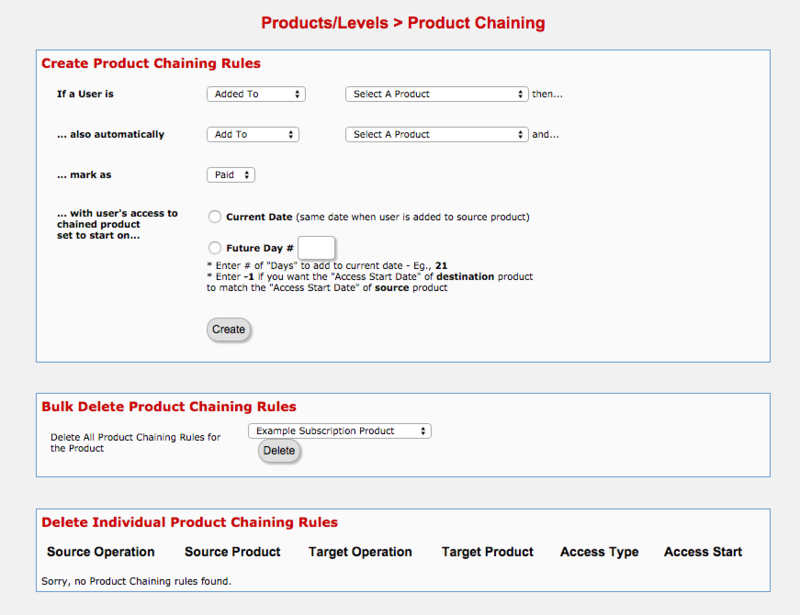 I don’t normally recommend Digital Access Pass because of how much configuration you have to do. That said, if you’re looking for ALL THE FEATURES, then you want to put this on your list. If you’ve had experiences with it, and what to share – leave a comment!